A frightening film about the rise of a small-time politician who quickly becomes corrupt, and Facist-like as he becomes the Governor, and then sets his eyes on the Presidency before he his shot down. Robert Rossen (received a nomination for Direction and for the Script). With Joanne Dru, John Ireland, John Derek, Ann Seymour, Sheppard Strudwick, and Katharine Warren. 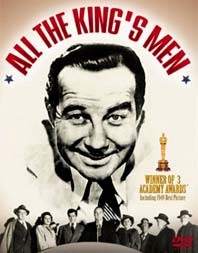 American Producer/Director/Writer, Robert Rossen (1908 - 1966), went to Hollywood with stage experience. Rossen's other works include: THE ROARING TWENTIES, A WALK IN THE SUN, BODY AND SOUL, THE BRAVE BULLS, ALEXANDER THE GREAT, THE HUSTLER, and LILITH. From the controversial best seller (and Pulitzer Prize winning novel) by Robert Penn Warren, which most believe was based on Huey Long of Louisiana.